As I sit here on the last day of 2018, thinking about how to summarize the last 12 months, it’s tough to put it all into words! Epic, Non Stop, Unexpected, Amazing adventures and Crazy Goals. 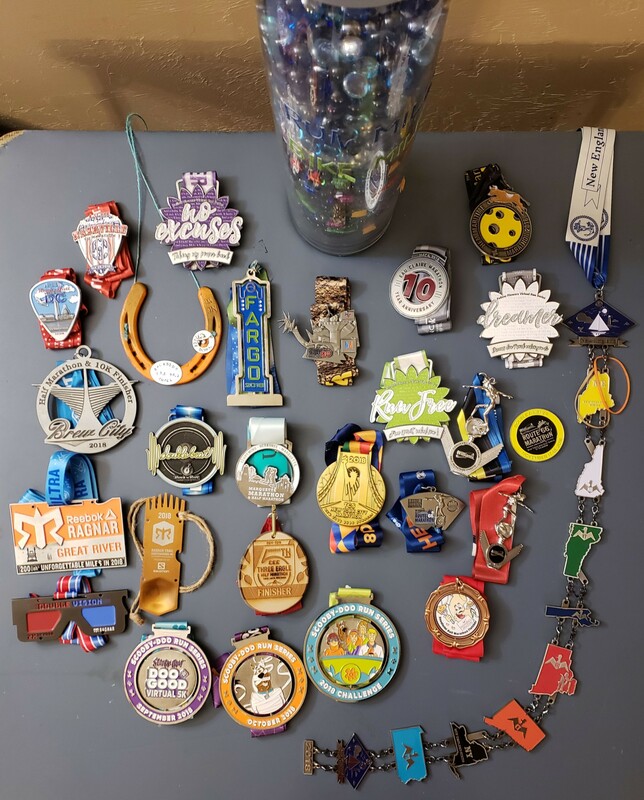 It was the year that truly revolved around my running and ultimate goal of running a half marathon in all 50 states (plus the bonus of Washington DC). This was not a goal that I was looking to complete this year, but I wanted to knock off more than just a handful of states. I went into the year with 1 major goal. 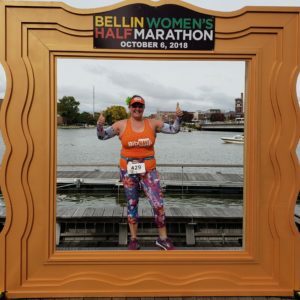 To “moon up ” in Half Fanatics to Venus, meaning I had to run 13 half marathons within 79 days! To help with achieving this, I wanted to complete the Mainly Marathons New England Series. 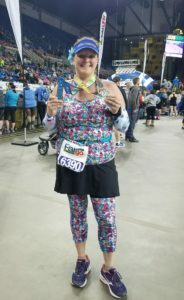 8 half marathons in 8 states over 8 days. It was ultimately going to be a 12 day road trip so I had to find a friend to join me on that one. But I’ll get to that adventure in a bit! The first few months was all about training and getting my miles back up after dealing with some foot issues over the winter. No races, to pressure, just working miles and getting myself back to where I was before my Achilles issues flared up. But then once we made it to March, the fun began! 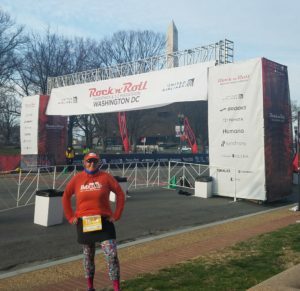 March 10th – Rock n Roll Washington DC – whirlwind trip to DC, flying in on Friday morning, exploring the expo that afternoon, running on Saturday and on a flight back to Milwaukee that same afternoon! I was in DC for about 26 hours, saw several friends and knocked off the bonus (+1) on the 50 state challenge! Full race recap here. 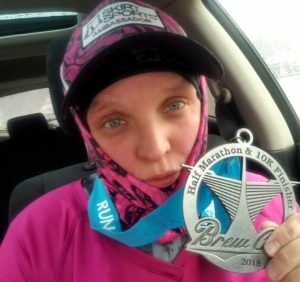 April 14th- Brew City Half Marathon, Milwaukee WI. This was one of the coldest, wettest races ever! What should have been a quick overnight trip to Milwaukee ended up being a 4 day adventure thanks to Mother Nature and Snopocalypse 2018 Maybe I should have been a duck. April 28th- Rock n Roll Nashville, TN. Back to Nashville for the 2nd time in a month. 1st trip was for my son’s birthday, this time was to run! Time to tackle some hill and enjoy Music City! April 29th- Backside Trail Half Marathon, Louisville KY. I am convinced that I will never learn my lesson about the hills of Kentucky! Equivalent to 85 flights of stairs and the course actually INCLUDED some stairs to go up! The Hills of Kentucky will keep calling me back! 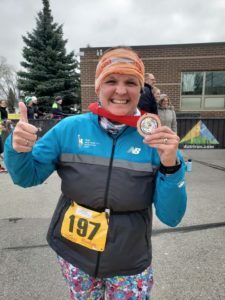 May 5th- Eau Claire Half Marathon, Eau Claire WI. Yes the weekend after back to back halfs, I was at it again! This time back in my home state! 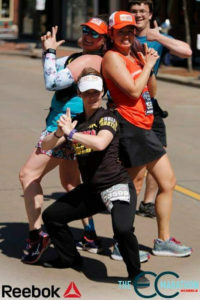 The day I met some amazing new friends, ran for donuts and got some EPIC FREE race pics! It’s all about the fun! May 19th- Fargo Half Marathon, Fargo North Dakota. The race that I didn’t know I was running until 2 weeks before! When they decided to send me to the Fargo Marathon to work the expo, I figured this was my chance to add North Dakota to the list! 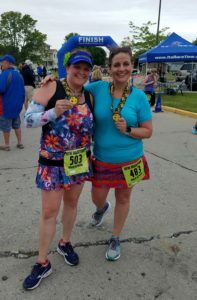 June 10th – Maritime Half Marathon, Manitowoc WI. Finally was able to add this race to the calendar! Perfect day for some miles along the lakeshore… and ALMOST a PR! 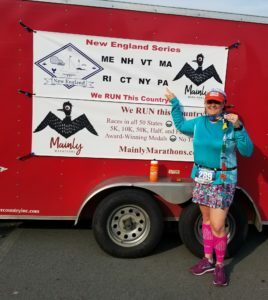 June 24th – July 1st Maily Marathons New England Series. I realized this week that I only did part one of the series of posts I was going to do about this epic adventure with Kelly. So apparently I have more work to do, but 8 halfs, in 8 states in 8 days is one thing I never thought I would do, but can’t wait to do another one of these series somewhere else! We are all a little loony! It was time to take a few weeks to recover from my crazy few months. After 14 half in less than 79 days (since I added Fargo I had a bonus!) I needed some time to let the legs rest and recover! 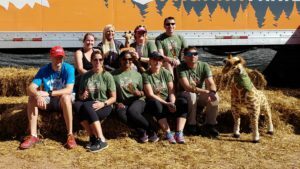 I spent the month volunteering at a few other events and starting to work on training for fall races. August 17-18th Great River Ragnar, Winnona to St Paul MN. 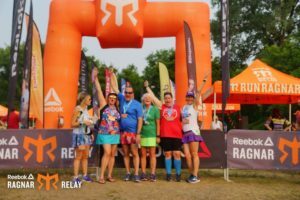 200-ish mile Ultra relay with team Five Innies and and Outie! Instead of a team of 12, we ran as a team of 6. Apparently I never did a race recap on this one! OOPS. It was a weekend adventure with friends new and old and one that none of us will soon forget…. in fact we have been trying to figure out when we are running the next one! 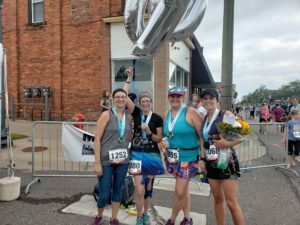 September 1st- Marquette half marathon, Marquette MI. Had the honor of running with Sue as she completed her 100th half marathon! It was another beautiful day to run in Michigan and the be able to join her in this celebration was priceless! Congrats Sue on completing your 100! 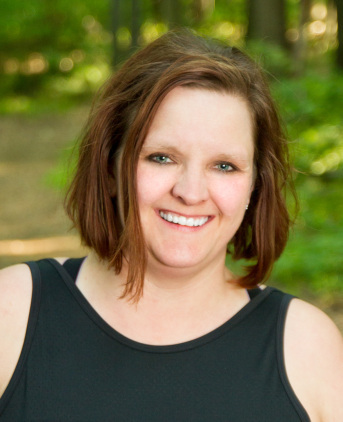 September 20-21st – Northwoods Trail Ragnar, Wausau WI. This was the 3rd year for this race, and the 3rd year we ran! What started out as a COLD and potentially wet weekend ended up being perfect! We ran our hardest and had an overall team time that was significantly faster than previous years! Again, apparently I never did a race cap… guess I need to work on that for the future and actually do recaps from these relays! October 13th- Three Eagle Half Marathon, Three Lakes WI The half marathon that I decided to run 2 days before! I needed a 15 mile training run for this weekend and my friend Karrie was running this event… so I tagged along for the fun! 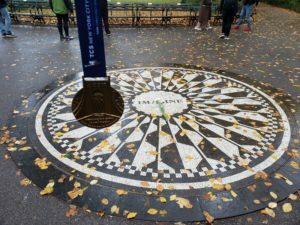 November 4th- New York City Marathon, New York, New York. I wasn’t planing on running a marathon this year, but when the opportunity came up with BibRave to run the NYC Marathon, I really couldn’t pass it up! A truly life changing race weekend! 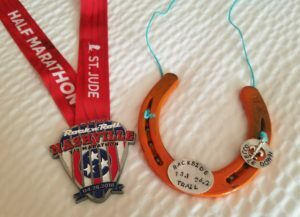 November 17-18th – Route 66 5k and Half Marathon, Tulsa Oklahoma. Skirt Sports Sisters mini retreat! 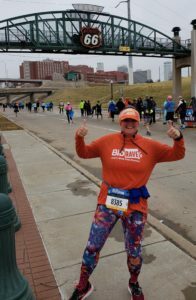 I few to Tulsa to meed up with a bunch of Skirt Sports ambassadors and run the iconic race on behalf of BibRave! It was truly a memorable weekend on so many levels, including running with Ray as he completed his 50 state half marathon challenge! Get your Kicks, on Route 66! 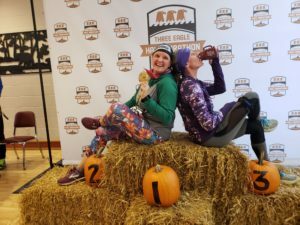 November 25th – Noodleini Half Marathon, DePere WI The last hoorah. The last race of the year! After a crazy month I didn’t know how the legs were going to handle more running so I went into this race not knowing how it would turn out. I told 1 person my goal, because I was that afraid that I could not achieve it. In the end, I did it. Another half marathon PR. Yes, I broke that PR that I set in October at Bellin by almost 2 minutes. And I just realized this was another race I never recapped. I guess I should do that soon! I already have a crazy calendar for 2019 and am excited to add more states, visit more places, meet more people and keep pushing myself to keep going! Where will I see you in 2019?? Stay tuned for my 2019 race schedule! To everyone that helped to accomplish so much this year, THANK YOU! I know that many of you had to deal with my crazy travel schedule, calling it an early night so I could get up early to get in a training run before it got too warm. I couldn’t have done this without out! To all the friends I met along the way, I hope our paths cross again soon!